The first episode premiered on twitter.com/voxox at noon on Monday and was a combination of a 140-character episode with an associated original graphic-novel-style illustration. This series features 14 unique and interesting characters, over 13 weeks for a total of 65 episodes. And each weeks worth of episodes takes place in a different scenario centered around a love story. 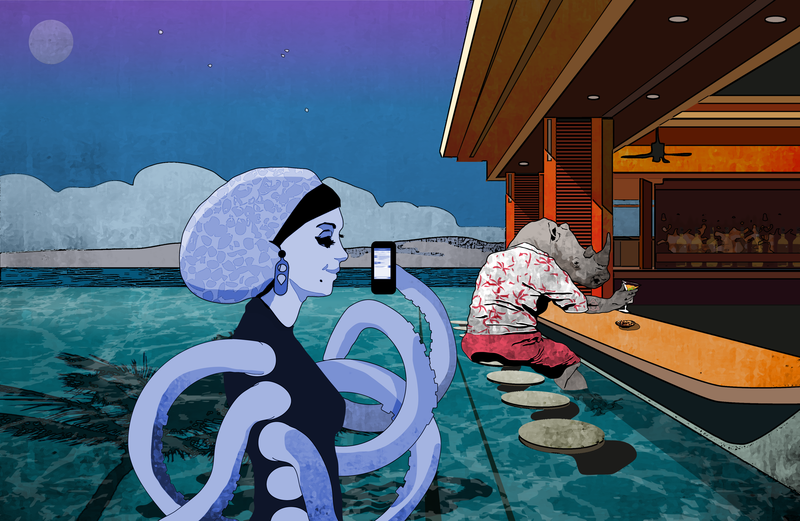 This first week is the “The One In A Bar” where we first meet our primary characters, Ratbane Rhinoceros and Oliebird Octopus. Future weeks will find our hero and heroine in dark alleys, sky diving, with zombies and a host of other mind-tingling situations. And like all good love stories this one also is touch-and-go. Will they or won’t they? Do we or don’t we get a happy ending? Tune in every workday at noon on www.twitter.com/voxox for a new episode. But if you miss it you’ll be able to find it again the very next day on our www.pinterest.com/voxox page and www.facebook.com/voxox page and also on our exclusive Tumblr page: www.ROFLaLoveStory.com. Theses next day posts and updates will be extended content, not just rehash of the original post. We will also have opportunities for our audience to get involved through contests and other exciting events. Viewers will also get changes to win ROFL swag and signed cells, so make sure to retweet, like, comment, share and show us the love. The love is after all why we’re at it!